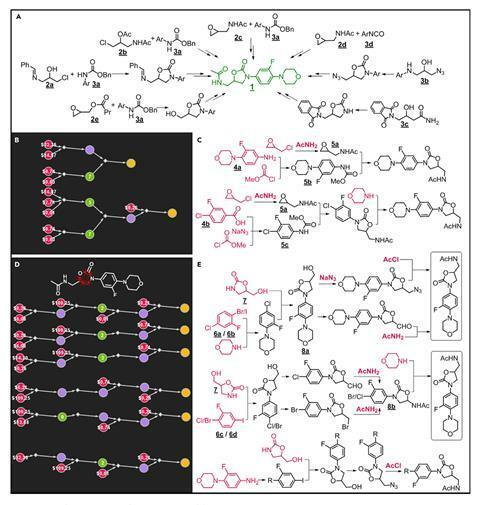 Chematica – software that can plan chemical syntheses – has been used to circumvent drug patents by avoiding protected pathways to target molecules. The new feature is based on an algorithm that can identify and preserve particularly important bonds in the target compound. Using this tool, the creators of the software could find new routes to several known pharmaceuticals. They believe their results could affect the way intellectual property (IP) is viewed in the future. Source: © 2019 Elsevier Inc. The team demonstrated how the software works by circumventing patented pathways to three commercial drugs. To start with, they instructed Chematica to bypass known synthetic routes to the antibiotic linezolid. The program found that most protected syntheses relied on the formation of an oxazolidinone ring and marked this ring as the motif to be preserved. It then designed several new paths (using different starting materials) within five minutes. The computer also generated plausible patent-evading syntheses for Merck & Co’s diabetes drug Januvia (sitagliptin) and Novartis’s multiple myeloma drug Farydak (panobinostat). Although the proposed reactions still need to be tested in the lab, Grzybowski’s team has already demonstrated that Chematica’s predictions work. The program, which was purchased by MilliporeSigma in 2017, is a hybrid between a database and artificial intelligence containing about 60,000 reaction rules entered by scientists. ‘It is a very sophisticated platform, uses lots of computing power and does synthetic planning on a par with human experts,’ Grzybowski says. Andrea Cavalli, a professor of medicinal chemistry at the University of Bologna, Italy, says that the new results could have an impact on the workflows of pharmaceutical companies. 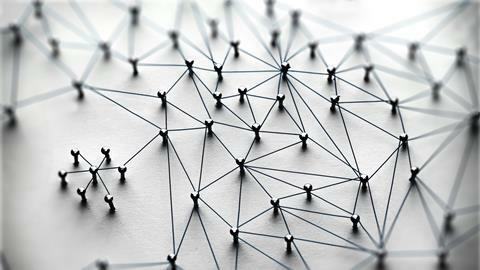 ‘The algorithm can help identify the most suitable chemical routes for making a new molecule, with large freedom to operate in terms of IP,’ he says. Grzybowski points out that tools like this one could help pharma firms make their IP systems more airtight. ‘This illustrates that our current IP schemes are quite inadequate and that computers can help big chemical companies protect their IP more effectively.’ But Pohl says that generic companies could find a good use for this software too. ‘Counter-intuitively, generic and innovator manufacturers may both benefit,’ he says.